According to the World Health Organization, over 60% of the world’s population has no access to ultrasound imaging for medical diagnosis. We're working to lower that statistic. From the jungles of Panama to the mountains of Nepal, our Global Health Program helps clinicians bring portable ultrasound to patients and institutions that don't have access to medical imaging due to social conditions, remote locations, or lack of funds. We've created two programs for healthcare professionals who want to bring ultrasound to the point of patient care. Read more to understand the difference between our SoundCaring Program and our SonoSite Global Loaner Program, then apply online or contact us to get involved. SonoSite's SoundCaring Program helps qualified medical organizations purchase new or refurbished portable ultrasound systems at a discounted price. Learn how to purchase discounted ultrasound equipment. 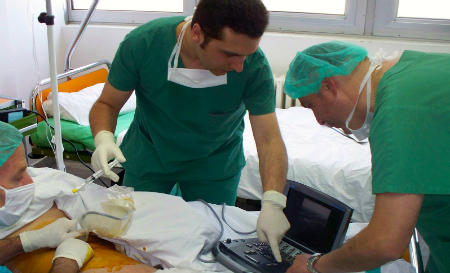 SonoSite's Global Loan Program loans ultrasound equipment to U.S. based medical professionals working with non-profit organizations. Learn how to apply to borrow ultrasound equipment.